New Delhi: The Samajwadi Party, or SP, general secretary Amar Singh on Thursday attacked the Congress party for allegedly betraying its trust and engaging in character assassination over the cash-for-votes scam, in a war of words between the two allies. 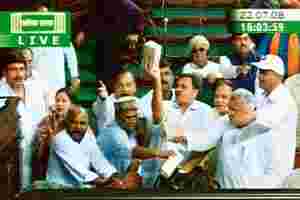 Singh’s anger was provoked by comments over the scam made by Congress Rajya Sabha member of Parliament Rashid Alvi on a television channel. “The Congress has betrayed trust. It is indulging in character assassination," Singh said. He said he was unhappy over the state of ties between the SP and the Congress. The SP’s support helped the UPA survive the 22 July trust vote, after the ruling coalition had lost the backing of its leftist allies over the Indo-US nuclear deal. Alvi denied having attacked Singh. He told Mint: “According to Amar Singh, I made an allegation on a TV channel about his involvement in the cash-for-vote scam while all I had said was that the Congress was not involved and about Amar Singh’s involvement, only he could answer that question." “If he can prove that I had made any personal allegation against him, then I am willing to quit politics. But if hecannot prove it, he should either quit politics or apologize," said Alvi. Singh’s public denouncement of the Congress comes ahead of a third round of talks between his party and the Congress on seat-sharing in Uttar Pradesh for the next Lok Sabha elections, due to be held by May next year. It also comes ahead of a Parliament session starting on 17 October. “On the face of it, it does seem that Amar Singh’s outburst just before the seat-sharing talks is a bargaining ploy. However, one must remember that this relationship has always been very fragile and friction-ridden," said Bidyut Chakrabarty, professor at the department of political science, Delhi University. “It was a quid pro quo arrangement where the Congress was hoping to create a base in Uttar Pradesh with the SP’s help," he said, while the SP allied with the Congress to combat Uttar Pradesh chief minister Mayawati, “its more powerful enemy". Both the Congress and the SP said the differences weren’t likely to affect their alliance. “These kind of disagreements are common in any alliance. Everything cannot go on smoothly all the time," said Congress spokesman Veerappa Moily. “Both parties have come to an understanding and such differences keep occurring. It will not reach a pitch that will threaten this alliance. Negotiations and bargaining will take place and we will sort everything out." Senior SP leader Mohan Singh said: “There obviously is a problem but such differences keep occurring. However, alliances don’t break this easily."